Whiff of Joy's Project of the Month April is to decorate an easter gift. Thanks Jacqui for the lovely theme. Thanks for stopping by, I hope you can enjoy the same lovely spring weather as I. The first preview of the Whiff of Joy / Elisabeth Bell summer stamp kit and the opening of pre-orders are not too far away :) Stay tuned! Ich habe diese kleine Gießkanne in meinem hiesigen Supermarkt entdeckt. Sie war schon mit einem Säckchen Schokolade Eier gefüllt. Ich entschied mich einen Tag mit den neuen Spellbinder's Label 4 Nestabilities zu machen. Ausserdem habe ich die Gießkanne noch mit Motivpapier, Spitze und Prima Flowers beklebt. Ich habe Elisabeth Bell's nachdenkliche Melinda und den Baumstumpf mit Copic Sketch Markern coloriert, ausgeschnitten und auf den Tag geklebt. Der Text ist handgeschrieben und mit dem Word Window Punch von SU ausgestanzt. Die Äste sind wieder mit der Sizzit Stanzschablone von Su gemacht. Paper: SU close to cocoa cardstock, SU bashful blue dp and "Afternoon tea"
Beautiful as always! Love your colouring :) The watering can was a great find! What a gorgeous easter gift Katharina, i love it. 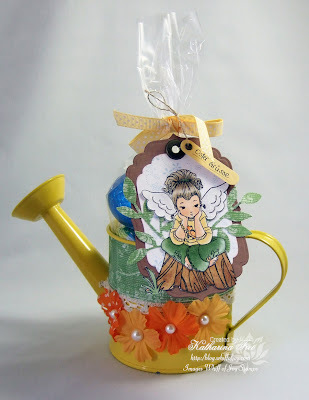 Love this little watering can such a brilliant idea! Love your sweet image just lovely! Wow!!!! Great gift idea! Great colors and the tag is just beautiful!!!! 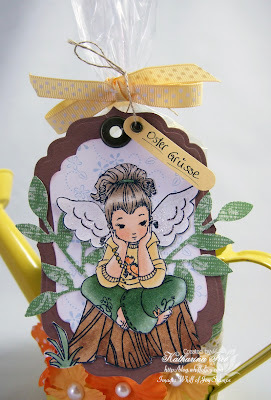 What a great idea to fancy up a watering can!! just gorgeous!!! so happy you're enjoying those stems! they look great! Absolutely beautiful! I can't wait to see the sneak peeks!! I wasn't able to play along with the Project yet...we are going on vacation tomorrow and had too much to do to get ready this past week. Have a happy Easter!